Over recent decades The Matarromera Group has brought the best of Spanish wine to the world. Its international expansion is such that no reputable restaurant will be found without one of the Group’s products on its menu and top airlines like Cathay Pacific offer them to their Business Class passengers. Although the wine group celebrates its 25th anniversary in 2013, the origins of the group go back centuries, to the ancestors of founder Carlos Moro, who were cultivating vineyards in the 12th Century. Matarromera was founded in Valbuena de Duero (Valladolid) and has now grown to encompass seven warehouses for the Rueda, Toro, Cigales, and of course Ribera del Duero names, supporting its work by opting for vineyards, wine, research, ecotourism and innovation. 150 people dedicate themselves to producing more than 3 million bottles a year. The Group also owns the only distillery in the whole of Ribera del Duero and has set up the largest and most modern molecular reconstruction plant in the world, where Eminazero, its internationally pioneering non-alcoholic wine, is developed. As Julio Pinto, operations director of the Matarromera Group explains: “Our traceability system is unique at global level, requiring unit coding and numbering of bottles, boxes and pallets.” The bottling formats used by the group are varied, including glass bottles of differing volumes and shapes together with plastic bottles and cans. Even the boxes vary depending on the quantities of bottles inside (3 units, 6, 12, 24, etc.). The complexity of labelling and coding for this group is multiplied for its most innovative products: non-alcoholic wine (Eminasin, Eminazero, Meliorzero and WIN0.0). 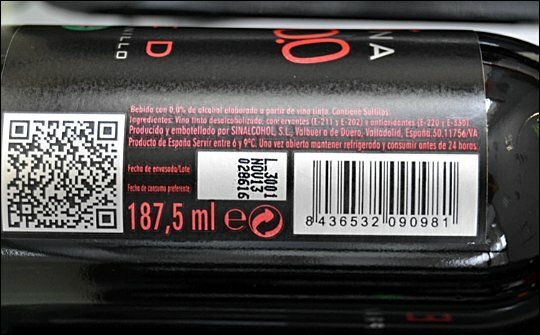 “In this case,” says Pinto, “we have to mark the best-before date on the labels on the back of each bottle, in addition to the batch and individual number of each bottle.” The most innovative formats for traditional wines, such as the 18.7cl plastic bottles, have a special covering to preserve the quality for months. The batch and bottling date must also be coded onto the bottle. With these requirements, and a market of 70 countries all with very different regulations, the producers “need to have an agile and flexible system for coding the labels and also for putting the labels on the boxes,” says the operations director. Cooperation between the coding solutions provider Domino and the Matarromera Group started in the 1990s with the incorporation of ink jet coding equipment for the labelling of text onto wine boxes. Now the relationship has grown with specific solutions for the Group’s new products Eminasin and Eminazero, requiring traceability for each bottle as well as differing coding requirements both on the back labels and on the boxes and pallets. The solution installed in the Eminasin and Eminazero plant was an A-Series ink jet coder, a high performance piece of equipment. This solution meets all the coding requirements from the coding of labels to coding directly on the necks of the bottles or the bottom of the cans, including the unitary numbering of the bottle as well as the batch; labelling the best-before date during the bottling of the products, and including the different texts required depending on the country of destination. 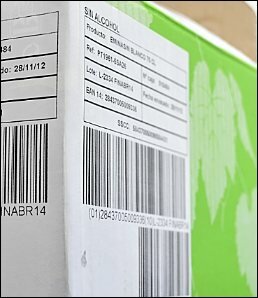 In addition, a printer and label applicator were installed ‘corner-to-corner’ allowing generic boxes to be personalised with texts and bar codes on both the sides on which the label is applied, including bar codes of the EAN/DUN-14 type, required for receipt and dispatch in automated warehouses; including the unit number of the box, useful for the individual follow-up for divided shipments, as well as the batch and other information. Finally, it can include the required variations in text according to country of destination, meeting legal and language requirements. A complete solution with immediate integration in the ERP, working constantly (3-4 shifts) on a highly demanding production line, with FAS criteria and Just in Time, the technical capacity to meet future requirements, as well as continuous customer service, influenced the Matarromera Group’s decision to continue to entrust their work to Domino.